Here we are facing a brand new year ahead. It seems like not long ago I was writing about what I wanted to achieve in 2013 as 2012 came to a close. I love the new year, its good to take some time to reflect on what we've been doing and also on what we wish to accomplish in the future. I'm not quite sure why, but it feels like starting with a clean slate every time. To that end, here's a look at the year that was 2013 and what will be 2014 in my development life. First of all, 2013 had a really exciting start for me. I started working on a new Flash game and also was given the opportunity to speak at Mochi's Flash Gaming Summit 5 in San Francisco. That was a huge deal for me and was my first big speaking role at an event of that type. It was definitely a memorable moment. As the year progressed I managed to achieve another goal which was to bring video tutorials to this website. Not every tutorial will be in video form as there are advantages to keeping things written, but video does have its strengths as well. Aside from video tutorials, I was also happy to be able to make good on my goal of getting more involved with HTML5 and JS. I'm still learning and so far I've stayed away from prebuilt engines due to some limitations; opting instead to create my own technology. I was able to create a fully working HTML5 version of Tetris, which is also compatible with mobile devices, and published a video tutorial to go along with it. In addition to the HTML5 technology, I am happy to say that I've also recently gotten involved with the Flixel Community project. Nothing I've done has been officially added, but hey, I just started a week ago so hopefully sometime soon I can merge some changes with the main project. Of course, not everything went according to plan in 2013. I had stated that I wanted to release a mobile project and that didn't happen. Also, I never did get around to looking into Unity in serious fashion. And finally, I was not able to release any games last year. 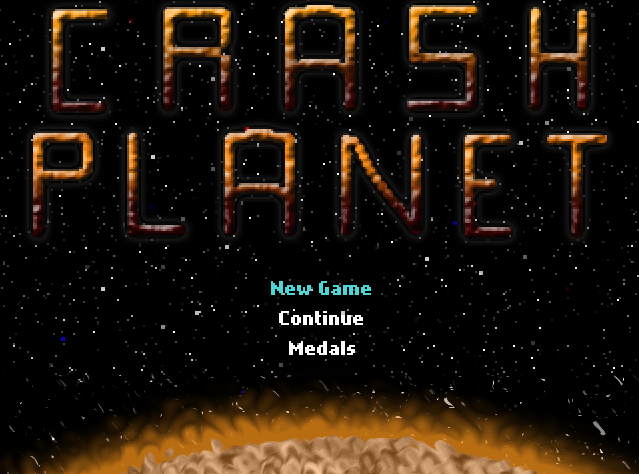 This sounds worse than it is though because all of those things didn't get done for the same reason: my current game, Crash Planet, has turned out to be a much larger endeavor than I had planned. It was supposed to be a 3 month project but it's been in the works for almost an entire year. The main reason for the delay? Art. I am by no means an artist, but I have been improving a lot with my pixel art since starting this project. Also, Final Fantasy 14 was released and I have to admit: I've been slacking on game dev work in order to play. The game is still coming along and hopefully I can finish it within the first quarter of 2014. I hope everyone had a great holiday season and enjoys the new year! Feel free to share your own goals for 2014 in the comments. This entry was posted on Wednesday, January 1st, 2014 at 12:01 am	and is filed under News. You can follow any responses to this entry through the RSS 2.0 feed. You can leave a response, or trackback from your own site.